A non-profit, United Way agency that develops and supports literacy programs in Habersham County, Georgia. Established in 1989 through a partnership with North Georgia Technical College, VFL began as an adult literacy tutoring service. Today VFL serves Habersham County residents of all ages through three signature programs: Read to Succeed, English as a Second Language and GED Scholarships. ​and Dec A Duck Contest!!! and Dec A Duck Contest!!! Be a DEC A DUCK sponsor for $100 and receive a "Big Yellow Duck" to decorate and enter in the DEC A DUCK contest held on Mt. Laurel Day. Categories are "Best All Around," "Most Creative," and "People's Choice." 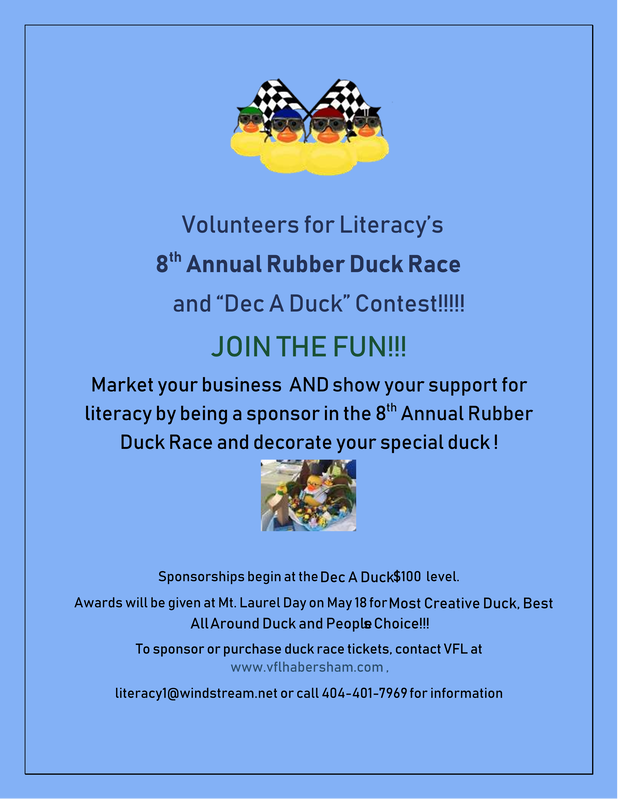 Market your business AND show your support for literacy.
. DEC YOUR DUCK today!!! First prize is $1000, 2nd is $500 and 3rd is $250. 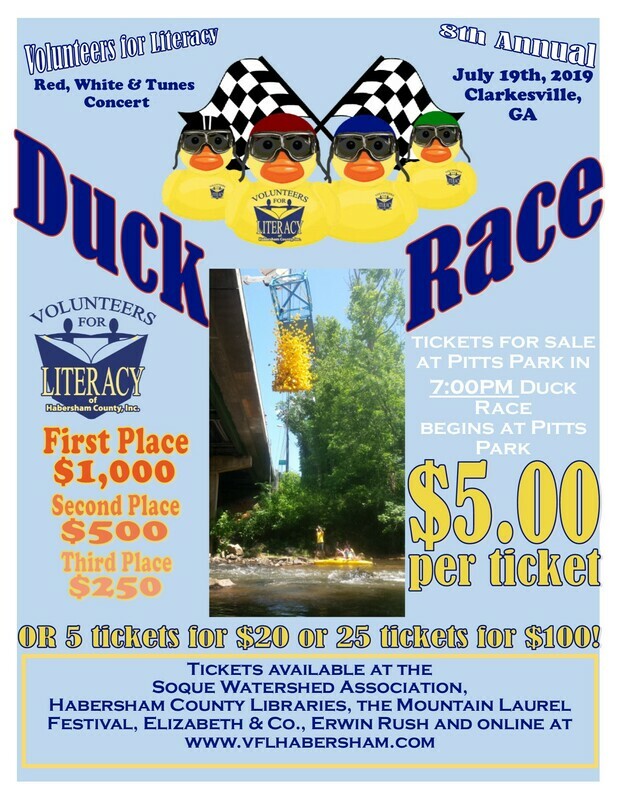 Race tickets are available at Elizabeth $ Co., Rahab's Rope, Soque River Watershed Assoc, office, from any VFL board member or by requesting tickets at www.vflhabersham.com or literacy1@windstream.net. Thanks to our 2019 VFL Duck Race Sponsors!!!! HELP AN ADULT EARN THEIR G.E.D. The Georgia Gives Campaign runs from November 1 until November 27, 2018. To donate to VFL visit the Georgia Gives Day website at https://www.gagivesday.org/c/GGD/. You may also donate year-round through the Georgia Gives Day website. All donations are tax deductible. To empower people through literacy so they can lead more productive and fulfilling lives.